This is the VIP Swag Bag that first 100 VIP entrant's will receive!! Looking forward to seeing you all there and good luck!! You can be a winner! 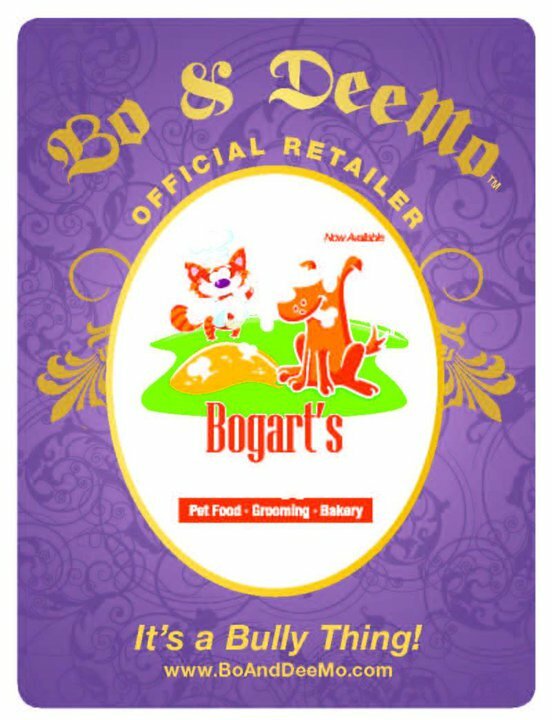 Just purchase your Bo & DeeMo product at Bogart's Bone Appetit! Each month will pull a winner! 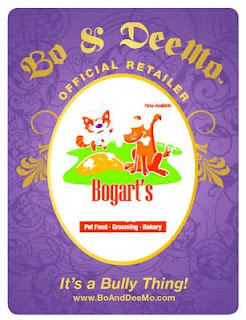 Purchase your Bo & DeeMo product at Bogart's Bone Appetit (Las Vegas fans) everyone else can purchase off our website! Send in a picture of your dog wearing our products and we will pull one monthly winner! You'll receive a B&D Bully Package and of course winner will be advertised in our Newsletter, ...Blog, and social media sites! EVERY MONTH! Either post on FB Wall or email us: Any questions email info@boanddeemo.com! Bogart's Bone Appetit is located on the SW Corner of Fort Apache and Tropicana! After all it's a Bully Thing! Have you RSVP'd yet? Look at what is in the VIP Swag Bag! Serious swag bag! This is what the first 100 VIP's will be getting!! This is where you submit to INFO@boanddeemo.com, not on the FB wall please. Thanks for entering!!! DOTTY'S DREAM.wmv "Last Year's Winner!" Creative Marketing Contest! Bo & DeeMo Go Retail! Where can you shop EXCLUSIVELY? Two of Las Vegas's pet powerhouses have joined forces! 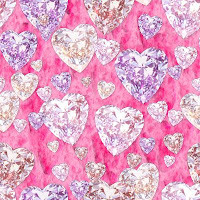 Canine Couture Fashion Designer Bo & DeeMo will soon be announcing that their line of custom made and designed Couture wear for Bully Breeds will be available to purchase exclusively at local pet boutique Bogart's Bone Appetit! As you might be aware...for the uniquely quirky bully breed one size does not fit all! Each design is hand fitted on an actual canine model...yes that is correct a canine model! Brings the world of "Dog Fashion" to a different level. A NEW level of comfort! 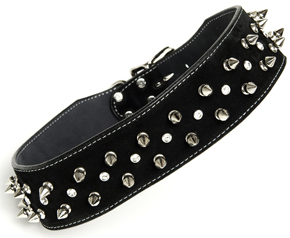 Each item is designed with soft stretch material that has lacings and will confirm to fit your Bully! Plus would you happen to be looking for a high quality jewel toned buttery collar with Swarovski® Crystals and a matching lead?? All in the store at Bogart's Bone Appetit! 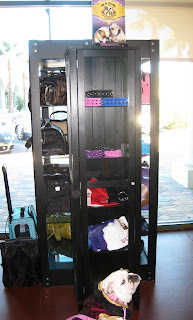 Bully accessories and clothing because after all....It's A Bully Thing! FYI!!! Las Vegans can ONLY get our products by shopping at Bogart's and the store Under Sells US the MFR! Apparel/accessories are available NOW (as of today). Another exciting event coming up....the hints are below!! Some very exciting news coming up!! Stay tuned!! But you will love it...combines beautiful objects and pets in need!! Casting Call for Bully Breeds! Does your Bully wanna model? CASTING CALL! BULLY BREED FASHION HOUSE AND CANINE COUTERE COMPANY BO & DEEMO IS HOLDING THE UPCOMING 3rd ANNUAL BULLY BABY MODEL SEARCH 2011! 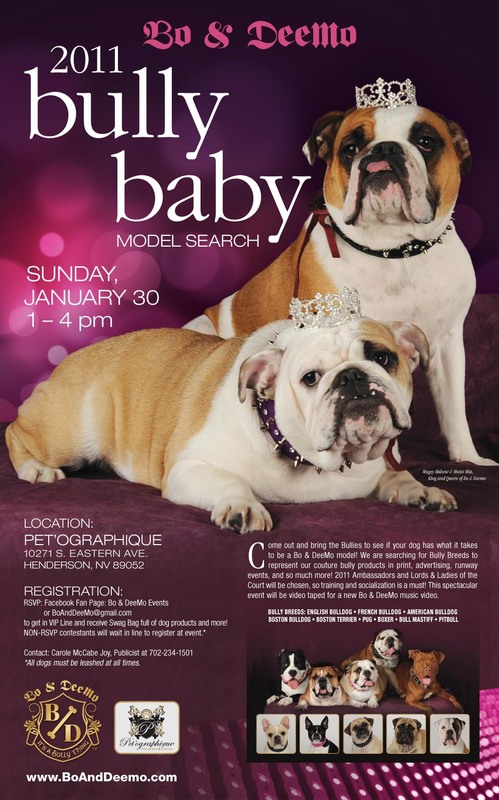 The 3RD Annual Bully Baby Model Search 2011 will take place on Sunday January 30th at local animal pet portrait shop Pet'ographique, who specializes in creating beautiful portraits that express the relationship between you and your pets. The event will be held from 1 pm until 4 pm and the Canine Model search is on! Bo & DeeMo need bullies for their NINE breeds (mix breeds welcome) to represent the company in print advertising, website, social media, event models, boutique events, rescue events and more! Also no age limits! All Bully Model Entrees must be socialized and have basic obedience. Trick training is a plus for event models! The first 100 entrees that RSVP on the FB Event page -http://www.facebook.com/event.php?eid=167505976619332 will be first in line and will receive a VIP Swag Bag full of Canine treats and goodies! Plus many breed specific rescues throughout the Valley will be contributing literature and items for the VIP Swag Bag. Last year’s event brought out over 200 would be models with their parents! Out of the hundreds of entrants “The Lords & Ladies Of The Court” will be hand selected and chosen to represent bully breeds with honor. Lords and Ladies assist Bo & DeeMo with the apparel design and sizing. This lucky group assists with being our hang tag models to help the consumer, choose the right size for their bully. Our Lords & Ladies represents THE BEST OF THE BREED befitting of their royal title. Last year’s Court and Ambassadors appeared in local magazines such as Luxury, Las Vegas Woman and were featured on KSNV-TV NBC Channel 3; KVVU-TV Fox 5 plus helpful bullies helped Bo &Demo with sizing revisions throughout the year to perfect patterns and details. The Red Carpet Birthday Fashion Show at Brio had Lords and Ladies and Ambassadors strutting their stuff for TV and Print publications. Bo & DeeMo specializes in designing one of kind in limited edition “Bully Couture.” Each design is specifically designed with the unique confirmation of the Bully Breed. Bo & Dee’s fashion Muses King Mugsy Malone and Queen Moxie Mia both English Bulldogs are the inspiration behind the fashion line. Designer Dee Mounts takes great care in picking out quality fabrics which will are not only comfortable but stylish as well. Taken into consideration is the touch and feel of how the fabrics and accessories interact with the Bully Breed and all dogs’ fur and skin. No itchy or rough woven fabrics allowed! Co-Owner Brandi shares Dee’s passion for the breed and brings her sense of fashion color and flair to each distinctive design. It's Our Blog!! Wrap up of Bo & DeeMo 2010! Plus what's coming up! For locally owned and operated Bull Breed Fashion House and Canine Couture Bo & DeeMo 2010 was a fun exciting packed year of events and the first Red-Carpet Canine Fashion Show! Bo & DeeMo specializes in designing one of kind in limited edition “Bully Couture.” These designs are specifically designed with the unique confirmation of the Bully Breed which is nine in total. 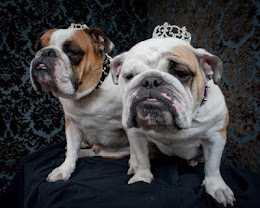 Bo and Dee’s fashion Muses King Mugsy Malone and Queen Moxie Mia both English Bulldogs are the inspiration behind the fashion line. Designer Dee Mounts takes great care in picking out quality fabrics which will are not only comfortable but stylish as well. Taken into consideration is the touch and feel of how the fabrics and accessories interact with the Bully Breed and all dogs’ fur and skin. No itchy or rough woven fabrics allowed! Co-Owner Brandi shares Dee’s passion for the breed and brings her sense of fashion color and flair to each distinctive design. October had all types of dogs and their owners come out to downtown Las Vegas boutique hotel The Gold Spike Inn for the first Annual Muttster Bash. Mayor Oscar Goodman granted Bo & DeeMo a Proclamation! October 28 will forever be Bo & DeeMo Day! The MC of the event was the effervescent and popular Charly Kayle of The KKLZ 96.3 FM Morning Show and the panel of judges included local media: Las Vegas’ Weekly - Allison Duck, Writer Debbie Hall, Las Vegas Woman Magazine Editor - Jennifer Florendo and Heaven Can Wait Animal Society Spokesperson - Holly. Well known Comedian Geechy Guy and his wife attended and were dressed as “Fork & Spoon.” All types of canine from Chihuahuas to golden Labradors to bully breed showed up and participated in the costume contest. Bo and DeeMo’s charity partner Heaven Can Wait Animal Society President Harold Volk was on hand to help fill the jar for a “Four Legged Star” which proceeds were donated to HCWS to help raise awareness for their great programs. Local favorite television station Fox 5 News Reporter Jon Castagnino came out to report on the event and it ran on the 10 pm – 11:30 pm news. Local businesses didn’t hold back with donations: NASCAR tickets, Staycations from The Golden Nugget and Mt. Charleston Lodge, Zip Line tours from Boulder City Flightline Tours, dog products, dog treats, themed breed baskets, show tickets, autographed calendars and so much more. November and December brought us right into the holiday season. Bo & DeeMo were looking for a way to help the local community and bring awareness to a segment of society which might be left out for the holidays. Low income seniors and their pets! Teaming up with Helping Hands of Vegas Valley and Bogart’s Bone Appetit over 2000 pounds of dog food, cat food, cat litter, animal accessories were raised and distributed to those in need. PSA’S announcing the drive ran on local stations including Kemp Broadcasting Stations KVEG 97.5 FM, KVGQ 106.9 FM and KMZQ 670 AM and CBS Radio Stations KLUC 98.5 FM, KXTE 107.5 FM, KXNT 840 AM and KMXB 94.1 FM and Highway Radio stations FM98/99-Highway Country-The Drive and were voiced by nationally known Comedian Bobby Slayton. On hand to lend her charm was nationally known Author/Adult Actress Sunset Thomas. Bobby Slayton commented on the event, “Glad that I could help out! I would like to thank my friend Sunset Thomas for stopping by and helping collect the food. A nice group of people and a great cause!” Sunset Thomas also commented that "I was grateful to be part of a good cause for my friends with paws!" All in all a great success for the Low Income Seniors and their pets! Also helping bringing awareness to this successful event were Dana and Dee with Moxie Mia being interviewed on Channel 13’s Week-End Morning Show by Reporter Jessica Lovell. 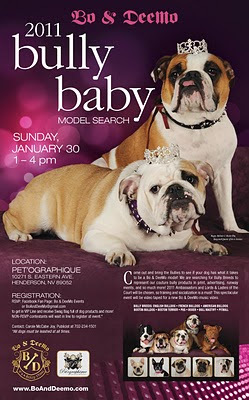 January 2011 will be the 2nd Annual Bully Baby Model Search 2011 on Sunday January 30th at local animal pet portrait shop Pet'ographique, who specializes in creating beautiful portraits that express the relationship between you and your pets. The event will be held from 1 pm until 4 pm and the Canine Model search is on! 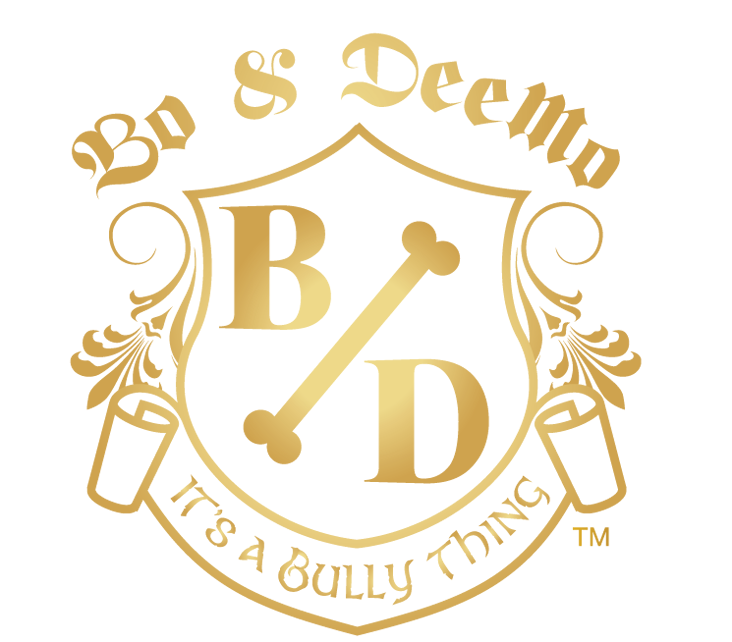 Bo & DeeMo need bullies for their NINE breeds (mix breeds welcome) to represent the company in print advertising, website, social media, event models, boutique events, rescue events and more! All Bully Model entrees must be socialized and have basic obedience. Trick training is a plus for event models! The first 100 entrees that RSVP on the FB Event page http://www.facebook.com/event.php?eid=167505976619332 will be first in line and will receive a VIP Swag Bag. Last year’s event brought out over 200 would be models with their parents! Out of the hundreds of entrants “The LORDS & LADIES OF THE COURT” will be hand selected and chosen to represent bully breeds with honor. Lords and Ladies assist Bo & DeeMo with the apparel design sizing. This lucky group assists with being our hang tag models to help you, the consumer, choose the right size for your bully. We know you will fall in love with each one of them as we will during their audition. Our Lords & Ladies represents THE BEST OF THE BREED befitting of their royal title. Bo & DeeMo Ambassadors will also be chosen at the Bully Baby Model Search. Ambassadors represent the company and support Mugsy Malone and Moxie Mia in many ways. Ambassadors will be asked to participate in boutique events, National Ad campaigns, animal rescue events, fundraisers, and more. To view last year’s event here is the link to Bo & DeeMo’s you tube channel which currently has over ------ views!